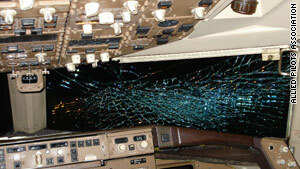 In 2008, the windshield shattered on an American Airlines flight between Puerto Rico and Pennsylvania. Washington (CNN) -- The Federal Aviation Administration is expediting an order requiring airlines to inspect windshield heaters on Boeing jets following an incident Sunday in which a fire broke out in the cockpit of a United Airlines B-757, shattering the plane's windshield and forcing an emergency landing. The FAA said an investigation into Sunday's incident is ongoing, and that the cause of the fire has not been established. But it said the incident prompted the agency to review the windshield heater issue and to speed up the inspection order. FAA spokeswoman Laura Brown said the agency will issue the order "as fast as possible," but that the date is still unclear. Originally, it was to be released in August. Both the FAA and the National Transportation Safety Board are investigating whether Sunday's fire aboard United flight 27 is related to the windshield heater or some other cause. The plane, traveling from New York to Los Angles, California, was about a half hour into its flight when a fire broke out near the plane's windshield, shattering the windshield in "a loud explosion," passenger Joe Frank said the pilot later told him. The pilots donned oxygen masks, declared an emergency and landed at Dulles International Airport near Washington. None of the plane's 105 passengers or seven crew members was injured. According to the entertainment website E! Online, several celebrities were on the flight, including actress Ashley Olsen, her actor boyfriend Justin Bartha, "Californication" actress Pamela Adlon and Jarrod Spector of Broadway's "Jersey Boys." Since 2004, at least six incidents involving smoke and in some cases fire have originated from window heating systems in B-757 aircraft, according to the NTSB. Most incidents ended without injury, but a pilot was cut by flying glass and passengers suffered smoke inhalation in 2008 aboard an American Airlines B-757 flying from San Juan, Puerto Rico, to Philadelphia, Pennsylvania. The plane made an emergency landing in West Palm Beach, Florida. Based on those incidents, the NTSB recommended that the FAA require the installation of redesigned window heating systems in all Boeing 747, 757, 767 and 777 aircraft. FAA officials said Boeing has issued voluntary service bulletins addressing the issue. Though airlines typically follow service bulletins, a United Airlines spokesman said Tuesday it was not immediately known if the aircraft involved in Sunday's incident had been inspected in accordance with the bulletin. The order to be issued by the FAA -- an airworthiness directive -- is a mandatory order. It will require airlines to either conduct routine inspections of the windshield heaters or to replace them, the FAA said. "We're very encouraged by the fact that the FAA has indicated a willingness to expedite (the order)," said Scott Shankland, a spokesman for the Allied Pilots Association, which represents American Airline pilots. "From a pilot's perspective, I can tell you that truly the worst problem you can have onboard an aircraft is a fire, particularly in the cockpit."